A Bluetooth Waterproof Headphone just made for you. Wear them while swimming or taking shower or doing any outdoor activity. 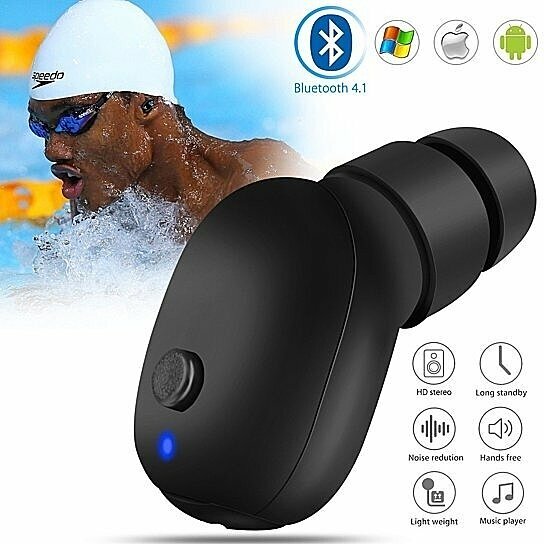 The rugged Bluetooth waterproof earphone is a well made high-quality product. It has an extra layer of silicone waterproof case that will float your earphone in water if dropped. Instant connection to your phone or any device with Bluetooth connectivity. Enjoy distortion and error-free music for 4 to 6 hours non stop and recharge again in just 1-2 hrs to get ready to use again. This mini marvel is a technology break thru with all sealed components and ear tight plug that will comfortably fit your ear and won't make it go red. The built-in mic will allow you to answer phones and even do voice command to your device if setup correctly. It comes with a keychain to go on your keychain, purse or a bag. Fully compatible with iPhone, Apple and Android devices. EDR automatic error correction for connected sound. Less than 5 grams weight. Waterproof IPX 68 up to 6 ft of under water w/ silicone cover. Water-resistant with IPX65 without the silicone cover in use. It comes in BLACK, PINK, AND TURQUOISE.